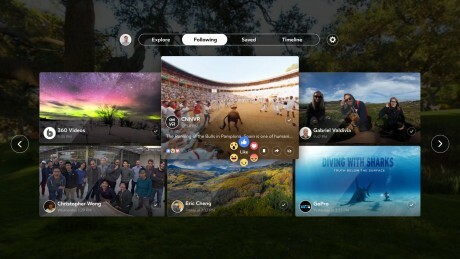 Facebook today announced Facebook 360 for Gear VR, a dedicated app to help Samsung device owners find and consume 360-degree Facebook content. The app is available to compatible Galaxy devices, such as the Note 5, S7, and S7 edge. The app features four main feeds for finding VR content. The Explore tab lets people find the most popular VR content from media companies and organizations, while the Following tab lets people find the content created and shared by their friends and family. The app also allows people to save 360-degree content from their News Feed into a dedicated folder, as well as relive memories via the Timeline function, which highlights the user's own 360-degree photos and videos. The Facebook 360 for Gear VR app also supports social interactions, such as likes. Facebook claims there are more than 25 million 360-degree photos and more than 1 million 360-degree videos available on Facebook. The Facebook 360 for Gear VR app can be found within the Oculus app on compatible Samsung Galaxy smartphones. Adobe today updated its Lightroom Mobile application and added the ability for Android and iOS devices to shoot in RAW HDR mode. Adobe says the new HDR mode automatically scans each scene to measure the best-possible exposure range and then takes three photos that are merged to deliver the widest exposure and contrast range. Samsung today said U.S. consumers can buy unlocked variants of the Galaxy S7 and S7 Edge. Sprint gave some of its high-end smartphones a speed boost this week. The company added 3-channel carrier aggregation to the Apple iPhone 7 and 7 Plus, Samsung Galaxy S7 and S7 edge, and the LG V20 and G5.